Is Regionalism Really a Good Thing? Regionalism has become the guiding force behind many initiatives – but is it good for Ann Arbor? A group of happy people gathered last Monday (November 21, 2011) to hear an important announcement. Department of Housing and Urban Development (HUD) regional administrator Antonio Riley was there to announce a Sustainable Community grant award to Washtenaw County and there were a number of elected officials basking in the glow. But the real star of the show was an idea, not a person. It was Regionalism. Many recent initiatives in Ann Arbor, Washtenaw County, and Michigan have been organized around regionalism, in which the role of traditional jurisdictions like cities, villages and townships is diminished in order to operate within much wider boundaries. The idea has a lot of appeal on the face of it. The reasoning behind it has several arguments. One is that certain functions, like transportation, naturally occur over larger geographical areas than the traditional political boundaries describe. A major impetus is that it is “good for business” because of efficiency in organizing and delivering services and administering policies (and business does not have to deal with “a patchwork” of regulations and politics). Perhaps the most persuasive to many is the opportunity to distribute benefits and services more evenly across boundaries, with less regard to the affluence of each locality. It is the basis of many of our Federal and state programs, where citizens are guaranteed certain benefits and protections whether in the poorest or most wealthy states or counties. 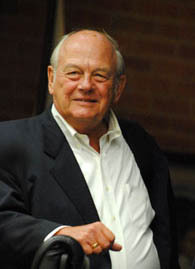 Tony Derezinski at a recent Ann Arbor council meeting. Courtesy of Ann Arbor Chronicle (photo has been cropped). This last is a strong moral argument that speaks to “our better angels” and our sense of community when it is being broadly expressed. It is an argument that lies behind some of the acceptance of the Reimagining Washtenaw Avenue project, which this grant is intended (even designed) to support. The siren song of intergovernmental cooperation and collaboration speaks in part to our response in Ann Arbor to the knowledge that Ypsilanti (city and township) is our sister urban area that is not as wealthy as fortunate Ann Arbor. One of the enthusiastic speakers at the announcement was Ann Arbor Councilmember Tony Derezinski, who has been the promoter of Reimagining Washtenaw Avenue since its inception. CM Derezinski is also a committed supporter of the concept of regionalism. As he said at the event, “We are a region, we are not just Ann Arbor”. And then he misquoted (with apologies) poet John Donne in saying, “No municipality is an island unto itself”. Here is the full quotation of the actual poem (really from a long essay). In other words, are we not responsible for each other? This is an easy emotional and empathetic argument which, unfortunately, runs into some practical and political brick walls on close examination. If you examine the history of humankind even at a superficial level, you will note that it consists of waves of geographical consolidation, followed by periods of revolt in the name of self-determination. The thing is that natural human communities are self-limiting. Right now, Europe is trying to work out how much member states will take on in respect of each other. In the United States, we are still arguing the dynamic of federalism vs. states’ rights. So if we are to extend authority across established jurisdictional lines, two things happen. One is that local control of just what services and options are offered is limited. Another is that one jurisdiction may find itself paying, at least potentially, for services received by another. The move to a countywide transit system. We have a number of posts about this, including the most recent on “Where the Money Is” . The decision was made a couple of years ago to emphasize commuter access to Ann Arbor rather than to optimize within-city service. Now Ann Arbor taxes are being used to pay for express buses to Chelsea and Canton, as well as enhanced service to Ypsilanti. The Governor’s transit plan. As we reported earlier, Governor Snyder has proposed a Regional Transit Authority that includes Washtenaw County. If enacted fully, it would draw all Federal and state transportation funds to itself, contract local bus service to AATA and other local entities, but emphasize major routes for the movement of workforce toward the Detroit Metro area, probably by use of Bus Rapid Transit technology. This would handicap the ability of local transit authorities like AATA to innovate and serve new needs locally. The Urban County. Ann Arbor was one of the first Block Grant communities in the state, and for many years was the only community in the county with Federal CDBG (Community Development Block Grant) funds to spend on human services and housiing. Washtenaw County formed the Urban County to make CDBG-funded services available to other communities. As described on the county website, the city’s Community Development department was merged with the county’s department and finally the City of Ann Arbor joined the Urban County. One consequence was that Ann Arbor lost nearly $400,000 a year in human services money that had been grandfathered in. As the memorandum provided to Council explains, this was to result in an increase across the Urban County of $100,000 in HUD-supplied funds. But those funds would be directed toward other uses (not human services). An increase to the county of $100,000 in Emergency Shelter Grant funds was expected to offset this somewhat. So while Ann Arbor formerly had human services money from a Federal grant and an independent Housing and Human Services Advisory Board to administer them, the City Council has been obliged to supplement human services from the Ann Arbor general fund in the last several budget years. This has led to heart-rending presentations from non-profit organizations that serve the needy and their clients. A search in the Ann Arbor Chronicle archives has many reports of such moments, including the one with paper cranes. At the same time, general fund support for human services from Washtenaw County has also been cut severely in the wake of County budget problems. In a triumph of bureaucracy, the County approved a Coordinated Funding model for distribution of services in 2010. This funnels all funds, including those donated to the United Way, through a goals-and-objectives process that is supposed to be more efficient. (An astonishing document prepared by Community Development touts the economic “return on investment” for nonprofit funding, quite a change in emphasis from human needs.) One result was slashing the funds allocated to the Delonis homeless shelter from $160,000 to $25,000 (see the account by the Chronicle). On an announcement that this would result in closing the “warming center” in which homeless individuals not in residence at the shelter can find protection on coldest nights, both the County and the City of Ann Arbor found some stopgap funds, just for this year. The A2 Success project and SPARK This is regionalism on steroids. The A2 Success project was begun approximately in early 2009 and has a number of economic development projects for the “Ann Arbor region” (which is essentially Washtenaw County with some incursions into Wayne County). SPARK, which began as a merger of the former Washtenaw Development Corporation and the Smart Zone, now styles itself “Ann Arbor, USA” and has been consuming ever more and more general fund support from both the City of Ann Arbor and Washtenaw County. Now a revived millage tax levied by the county will give SPARK over a quarter of a million dollars next year. Regionalism Rules – but what about Localization? Clearly the concept of regionalism has the support of most of our political leaders, and it has a powerful and persuasive voice. But does it really benefit the community that we have within our City of Ann Arbor? Or is it actually an effort to exploit the resources that we have, including our educated population, our positive image countrywide, our strong cultural environment, and most of all our tax base? In other words, is regionalism at the expense of Ann Arbor taxpayers supportable only for altruistic reasons? Or does it bring our actual community actual benefits? You wouldn’t expect a blog called Local in Ann Arbor to espouse regionalism, and you are right. As we said in our first post, we support something of an opposite concept: localization. In “What Does It Mean to be an Ann Arbor Townie“, we tried to put forth the case that we have an unusually desirable place to live because of our special local character. But it goes beyond that to a belief that a successful, resilient community is built on interdependence at a local level. To some extent, we must be an island – and island economies are notably self-sufficient. Localization is a world-view, a prescription for living, and a field of academic study. I’m looking forward to the coming book on the subject, The Localization Reader, by UM professors Raymond De Young and Thomas Princen. You’ll hear more on this from us another day. UPDATE: This post is not the place for a full discussion of allocation of costs in AATA’s regional outreach. However, the attached Report to the Treasurer from last year (it does not include the special service to Ypsilanti) shows the contribution of Ann Arbor taxpayers to the Commuter Express projects. The University of Michigan does not contribute directly to this service (as stated in a comment below), but rather compensates employees for the cost of their fares. The report indicates that 31% of this service (to Chelsea and Canton) is paid for by Ann Arbor taxes, and 26.4% by fares. The remainder is picked up by State and Federal operating assistance. NOTE: Readers of this post may also find discussions of governance in this post on regional transit plans and its sequel of interest. The two posts discuss governance issues for regional authorities. NOTE: We have now begun a new series on this subject, beginning with Regionalism Reconsidered. This entry was posted on November 27, 2011 at 11:42 am and is filed under Basis, civic finance, Neighborhoods, politics, Regional, Sustainability, Transportation. You can subscribe via RSS 2.0 feed to this post's comments. Responses are currently closed, but you can comment below, or link to this permanent URL from your own site. Wow, I love your cogent argument for examining the costs as well as the benefits of regionalism, and for examining the pattern of flux in the tides of history. I’m very interested to understand more about how you think localization differs from regionalism and how costs and benefits balance there. Thanks, Kim! This definitely will not be my last word. The basis for “regionalism” is that larger is always better–meaning more cost effective. Usually, prove the rightness of going regional, numbers are crunched to support the move to junk a local (municipal) program in favor of something “regional”. But those numbers need to be carefully examined and understood because usually there’s plenty left out of the analysis for the simple reason that not everything can be calculated. Local control and participation of citizens in decision making eludes the prowess or interest of the creators of those spread sheets. A good example is the AATA. Citizens of Ann Arbor have been paying into this transportation system since the 70s. Now there is a push to use the infrastructure paid for by Ann Arbor to serve the whole county–whether or not the rest of the county agrees to pay. Ann Arbor won’t be compensated for the decades of infrastructure it has created. Also, it loses control of routing and fares–not that the AATA board has ever much listened to Ann Arbor. So the prospect of having any say in the future of our transportation system doesn’t necessarily include citizen/taxpayer input. Regionalism should never be imposed from outside the localities. It needs to be employed where the costs and benefits are honestly and clearly enumerated. Like efficiency, “regionalism” is not an end in itself. This is a social issue not geological so there is no natural imperative for conglomeration. I was an “Ann Arbor Townie” for 25 years, and have lived in Ypsi Township for going on 26 years now… Perhaps I can claim to have some balance in perspective. And the gist of my comment here will be to urge a balance of local and regional interest. Local vs. regional is a balance that has been hard to achieve throughout history. Vivienne, you mentioned the ebb and flow of larger and smaller kingdoms; consider the Roman Empire, which brought peace to a large part of the Western world…along with frequent despotism and abuse. Would the world have been better off without its achievements? In our own country, the Articles of Confederation leaned too far toward localism and didn’t work; it took years to arrive at a workable federalism in the Constitution. Before coming to Ann Arbor, I lived for about 9 years in Bethesda, Maryland, which shares many of Ann Arbor’s characteristics (educated, well-to-do residents and a large research institution – the National Institutes of Health). Maryland has opted for a different balance of local vs. regional government, more toward the regional. There are no township governments in Maryland; cities and counties are the only local governments. Bethesda is not a city, but is administered from the Montgomery County Seat of Rockville. Without going into detail, I have to say I am really impressed. Local squabbles over money and power exist, but play out mainly in the County Council. They have a very effective county-wide transit system, and have worked successfully to improve corridors that lack local finances for improvement. In spite of using revenues raised in Bethesda to benefit other parts of the county, Bethesda remains one of the wealthiest communities of its size in the nation. Two considerations you didn’t mention, Vivienne, considerations which may or may not figure in the “spreadsheets of the policy makers”, LuluGee. 1) We the people of Michigan are not simply in competition with one another. We are in competition with places like Metro London, Metro Bangalore, Metro São Paulo, and Metro Shanghai. It’s not simply that “bigger is better”, but that even mighty Ann Arbor isn’t powerful enough to take on these giants single-handed. As for Ann Arbor taxpayers supporting AATA’s service to other parts of the county: don’t forget that the University is paying a big chunk of the cost of service to Ypsilanti, Chelsea, and Canton. They do it because it’s cheaper than building more parking structures – which in turn benefits A2 residents by reducing city land wasted for daily automobile storage. Spreadsheets on both sides of an issue tend to leave out awkward, unpalatable issues, LuluGee. So though we disagree, let’s keep up the conversation, and keep working for the best balance. Thanks, Larry, you always bring a valuable perspective to the conversation. This one almost needs a new blog post to answer. I’ll just take your paragraphs in order. 1. I agree, the local/regional/federal/global dynamic is difficult to resolve and it may depend on what the subject is where one falls between self-determination and broad consistency. For example, the Civil Rights law was much resented in many Southern states but we can be proud of our country by flouting their local will on those issues. But recent efforts to impose a (often weaker) Federal environmental standard on the State of Michigan are alarming. 3. (Your #1) Why and how should Ann Arbor compete with some of the largest metro areas in the world? And for what? It is literally a world apart from those. 4. (Your #2) I won’t press the “island” metaphor too far – blame John Donne. But I get really, really tired of the implication that Ann Arbor is a wealthy elitist community. Many highly paid UM administrators and faculty (as well as CEOs, etc.) live in plush township subdivisions, not the city. In my 5th ward, we have many modest homes and people who are lower middle income. A major reason that I argue the points that I do is to keep Ann Arbor as a diversified place where people of many different incomes can live and have a good quality of life. 5. Regarding UM’s support of service outside the city, please see the update to the post with information about Express routes. I don’t yet have a comprehensive budget for the Ypsilanti #4 expanded service, but I’m pretty sure that a good fraction is paid for with Ann Arbor taxes. Your 1: Yes…what a tricky area state vs. federal power is! It was arguably the biggest issue in the Constitutional Convention of 1787, and I hope the debate will continue as long as our country exists. The Europeans are going through a very similar agony of debate right now, and it’s healthy as long as we rely on reason rather than emotions. Combining your 2 and 4, focusing on “But it is unfair to ask Ann Arbor residents to subsidize residents of areas that have lower taxes”, and “Many highly paid UM administrators and faculty (as well as CEOs, etc.) live in plush township subdivisions, not the city”. Two good points, Vivienne. I’ve been digging around in the Census Bureau’s “American Fact Finder”; lots of interesting info (mainly estimates, unfortunately). Ypsilanti City: 7,868 households, $32,741 median income. Your update and point 5 indicate that AA taxes are indeed paying for more of the express service from outlying areas than the University is paying through its “farebox” subsidy. But I must reiterate that Ann Arbor benefits disproportionately from these services. It works in two ways: first, the people who come into AA (whether on express or local buses) are supporting AA businesses, either through purchases while in town or by enabling relatively low-wage workers to get to jobs in the city. And AA benefits by having to provide fewer parking spaces for incoming employees. The library lot structure is admittedly an extreme example at about $72,000 per space, but providing parking takes a toll in land resources and money that can never be fully recovered. The more transit is available from outside the city, the greener the city can be. And having affordable transit into AA also reduces city population pressure, which leads to developers wanting to raze those quaint old neighborhoods you’ve defended in previous blogs. But it’s your point 3 that I take the greatest exception to. You write, “Why and how should Ann Arbor compete with some of the largest metro areas in the world? And for what? It is literally a world apart from those.” Like it or not, we are in competition with the rest of the world. Two of my three children, all of whom graduated from Ypsi High and did well in college, left Ypsi, not for Ann Arbor but one for metro Seattle and the other for metro DC. They illustrate an unfortunate trend in which our talented young people leave for more exciting, lucrative, and “vibrant” metro areas. This year we’ve had an earthquake in Japan that profoundly affected auto and electronics sales around the world, including here. As I write this, Europe is undergoing a financial agony that has slowed our recovery from recession, and threatens worse. Tom Friedman has thoroughly and clearly shown the intellectual competition between the US and the rest of the world. Lou Glazer’s Michigan Future (http://www.michiganfuture.org/) has meticulously documented the factors that influence the success or failure of US communities, and points clearly to the importance of regions as opposed to small jurisdictions. All of these point to a need for greater cooperation between little units of government, banding together for strength rather than squabbling over local issues. The decline and fall of the Detroit metro region has provided ample proof of the futility of “success by fragmentation”. Will banding together work if we’re unfair in the way we do it? No. But if we attempt to remain “local”, Southeast Michigan will get left behind economically and intellectually. To succeed, we must be guided by a comprehensive view of facts, not by parochial interests. Detroit is the proper center of economic life and population for Michigan. This is unfashionable to say in Ann Arbor, but it remains true. It is Detroit that is competing with Shanghai – not Ann Arbor, except as an extension of the Detroit metro area. In that sense, development in Ann Arbor IS sprawl, and a move away from regionalism. Chrysler’s “Imported from Detroit” tag line is orders of magnitude more powerful than the “Ann Arbor, USA” tag line of SPARK. This is all the more true when our misguided (if well-intentioned) political class seeks to destroy the very things that give Ann Arbor something distinctive to market to the world. Ann Arbor does need to expand its boundaries to avoid becoming either Disneyland (best case), or just another failed central city (worst case). My 2 cents is that the city should be co-terminus with the School district. How we provide a services vs. tax mix that will appeal to nearby township residents is the question by which hangs the future of our town. When people – especially people with kids – think of a town as the place to live near, but not the place to live in, that town is in trouble. Ann Arbor does need Ypsilanti to thrive, for Ann Arbor’s own selfish reasons (no one wants to live next door to the social dysfunction that often accompanies poverty, and we need another “cool” place in the immediate area, as the cool parts of Ann Arbor are actually pretty small, and getting smaller by the minute). We don’t need to – and should not – depend on altruism as a justification for re-development efforts. Feeding, clothing, and housing the poor make good altruism projects. Building public infrastructure should be the result of other processes. One can make altruistic arguments for, say, universal public education, but the enlightened self-interest arguments for it will, I submit, result in better education for the bottom 50%. I fully support the redevelopment of the Washtenaw corridor – I have run for office on that idea, among others. I also fully oppose the creation of yet another unit of government, with its inevitable non-value-added overhead and bureaucratic fiefdoms. We have enough local governmental units in both Ann Arbor, and Washtenaw County. There is a much stronger case for county-wide government than there is for the creation of new local governments that overlap/duplicate the functions of existing local governments (e.g. budgeting, accounting, employment of planning staff, legal counsel, administrative assistants, accounting staff, agency head, department heads, renting offices, phones, ISP, copiers, signage, logo designers, letterhead, etc. In addition, the idea of pre-budgeting public money (aka “Incremental Financing”, or “Tax Capture”) is bad policy: it does not allow public funds to be put to their highest and best public use, but determines that general fund revenues will be siphoned off for the use particular interests. Of course, tax capture districts – in Michigan, anyway – are not responsive to citizens, but to the political class in power in the various jurisdictions that make up the district. Tax capture districts are a bit like having your US senators elected by the state legislatures, rather than by direct election of the people. Direct elections of US senators was promoted to lessen the power of entrenched political/moneyed interests, and increase the power of citizens. Tax capture districts are not accountable to the electorate any more than legislature-elected senators are accountable to the electorate. The soundest argument against regionalism is that it creates government that is less responsive to citizens, whereever they live, than the existing local governments. The soundest argument in favor of regionalism is greater government efficiency. A functional political culture could give us the best of both worlds. Alas, we do not now have a functional political culture. 1. All of the local police and fire departments be merged into a county-based system. In other words the sheriff’s department becomes the local police force and we have a county fire department. 2. I would suggestion that the same solution be applied to the district libraries, road repair etc. I’m a townie and life-long Ann Arborite, and to say that we aren’t tied into the county/southeast Michigan economy does not ring true to me. I know many people who work for the Big 3 or related firms, and live in Ann Arbor. I know many folks who work in Ann Arbor but live outside the area. In terms of controlling our town, I would note that the biggest insulating factor Ann Arbor has from the greater Michigan economy and one of the reasons Ann Arbor is considered such a cool place is the University an entity over which Ann Arbor has virtually no control. This is a good discussion and very timely. I have been incubating a draft post updating my thoughts on regionalism. There have been a number of discussions about the effects of our Michigan governance structure on the way the area develops, including the problems Detroit has had. I think Governor Snyder shares your thoughts on combining functions or even direct governance across traditional lines. Efficiency and business friendliness are the usual reasons. But the feelings of the “customers”, as we used to call citizens when I was on the Board of Commissioners, may be different. Questions of equity (especially in who pays and who benefits) and differential preferences for service level become large. This discussion will continue. It is an important one. Right on, Peter. There are many states where the counties are the next level of government up from incorporated cities. I’ve lived in two: Maryland and Florida. Both have really excellent county police, fire, school, and library systems. People moving from Florida have wondered why taxes are so high here. It has a lot to do with climate, but more to do with multiple and fragmented layers of government and services. As the Ann Arbor and the University: Ann Arbor can try to isolate itself and stop further growth, but the University will keep growing. People hired by the university (medical and research people) will commute to Ann Arbor if they can’t live in the city, and the University and City will, per force, need to work together to deal with the traffic and the automobiles that need a place to park while their owners work. *Or* the City can work with surrounding areas to improve and coordinate transit. If people realized the true cost of providing parking (even if the University is paying for the construction) they would be more likely to support both smart growth in the City and coordinated regional transit. Yes, Larry, I lived in California for a decade. That is another state where the county is the major local government apart from incorporated cities. It makes for much more effective regional government. It was a shock to me when I assumed a place on the Washtenaw County Board of Commissioners and discovered the limits of county government here. I am actually a regionalist, but only if the basic structure of government permits it. Michigan does not. The township system presents a number of barriers. In my most recent post, https://localinannarbor.com/2013/10/20/the-reach-for-the-ride-local-governments-and-funding/ I review some of those. What I find problematic is that most regional efforts in Michigan require the surrender of local sovereignty for some but not for all. In particular, you and others are especially willing to have Ann Arbor residents foot the bill for all the tax-avoiding communities surrounding it. Yes, I wish it were practical to return the “center of gravity” of Michigan government to a more regional level – to the counties. Not at all likely in my lifetime, though: too much entrenched power in the townships, and too many people whose political philosophy supports keeping power at a local level. So, though I believe Michigan would be much better off without the township level of government, I’m not actively seeking to get change it – waste of my time and energy. I’m glad you clarified your belief that we are “willing to have Ann Arbor residents foot the bill” – though troubled at the same time. One of my continuing frustrations with American politics in general is the extent to which people will try to get “someone else” to pay for services we want. From that perspective, just about everyone is “tax-avoiding”. For elected officials, the political calculus therefore demands guessing how much money they can ask their residents to pay without getting themselves thrown out on their ears. For those in more affluent districts, this translates into a fierce defense against other districts taking advantage of them, as you have just said. 1) Ypsilanti Township intends to put a millage issue on the ballot to support our share of the transit bill. We know it will cost money, and expect to pay for our fare share. Please don’t accuse of trying to freeload. 2) In your remarks earlier about the policing dispute, you have not addressed the issue in an unbiased way. From our point of view, we had a policing services contract prior to 2006 which we budgeted and paid the county for. The Sheriff’s Department then unilaterally violated the terms of the contract and demanded far more money. That’s the perspective of the residents of Ypsilanti and the other two townships who sued the County, and until you acknowledge that perspective, you will not be speaking fairly about the issues. General observation 1: It’s almost impossible to “fairly” distribute the cost of transportation systems. This is made very clear in conferences like this, where we hear from people in all parts of the country talking about the same kind of problem we’ve got in Washtenaw county. If you think about it, you’ll realize that the gas tax we pay in Southeast Michigan goes to pay for roads in the U.P., whether or not we use them. That’s because we buy more fuel per mile of road here than they do up there. Yes, our roads therefore need more maintenance, but even so, more money from the south is used up north than vice versa. There just is no way to be totally fair about the distribution of transportation funds. General observation 2: All trips have a beginning and an ending point. If the cost of the trip is subsidized by local government entities, both the entity at the start and the entity at the end of the trip are responsible for subsidizing part of the trip. Why not just the entity at the start of the trip? Because even if the traveler pays taxes in the starting rather than the ending jurisdiction, the entity at the end of the trip benefits from the person traveling, either through money that person spends at the destination, or from services rendered. And conversely, if the traveler is using an automobile, the jurisdiction at the end of the trip must subsidize road-space and parking-space for the automobile. Many people are quite unaware of the cost of parking space, but it’s very substantial in many ways. That’s why, if Ann Arbor is the primary destination of people using AAATA, it is not unfair to expect *some* (certainly not all) of the subsidy to be borne by Ann Arbor’s citizens. I realize this topic needs more exploration, and look forward to doing that in the near future! Larry, it is not accurate to my knowledge that Ypsilanti Township is going to put a millage issue on the ballot. If the issue does go on the ballot, it will be the AAATA that puts it there. If YT is accepted into the authority, it will be on the ballot in three different jurisdictions. I will be writing a blog post about this. Regardless of your “perspective”, your statement about the policing contract is not accurate. I’ve commented and documented on that issue extensively on the post https://localinannarbor.com/2013/10/12/the-tumultous-politics-of-ypsilanti-township/ and I don’t wish to argue the point further here. Since this post is two years old and there are more current posts on related subjects, comments are now closed for this post.